Since 1993, Influential has been using its years of Business Intelligence experience to ensure our clients buy the right licences at the best price. Our aim is always to deliver the best and most cost-effective BI solution for all. As a SAP Gold Partner, we are experts in all aspects of SAP BusinessObjects. This means that there is no more trustworthy partner than Influential when it comes to BusinessObjects Licence services. Beyond licence procurement, we offer support based on our extensive experience in a range of related areas, from the involved processes of deploying BI software solutions to integrating with your existing IT, configuring for your needs, and fully capitalising on the potential. For 25 years we have been implementing reliable solutions to suit clients’ needs, removing the potential disruption and risk of installing unfamiliar BI technology. 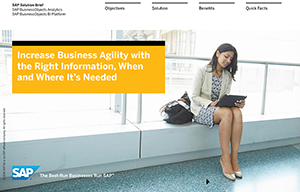 SAP BusinessObjects offers a market-leading, comprehensive suite of functionality for all companies which are looking to get the most from their data through agile visualisation, data discovery, reporting, dashboards, and predictive analytics. To survey our full range of BusinessObjects Licence activities, please visit www.buyalicence.com. The SAP BOE platform combines agile Discovery and Analysis, Dashboard, and Reporting for all skill levels of the end user, as well as Predictive Analytics and Data Integration with a market-leading, centralised BI infrastructure complete with sophisticated support for security, administration, and BI content distribution. The semantic layer hides the technical underlying detail from the end user, while also ensuring a consistency of terminology and rapid development of reports and dashboards. SAP BusinessObjects excels in analytics, data integration, information delivery, meta-data management, performance management, reporting and querying, scalability, and overall technical architecture. SAP BusinessObjects Edge is the BI tool of choice for mid-size companies which are looking for a lower-cost licence but with similar levels of functionality to the BOE Platform. The entry level price is based on only 10 Named Users and is an ideal option for smaller companies looking to have the power of enterprise BI tools but at a reduced cost.